For Swine: Treatment of Porcine Proliferative Enteropathy (PPE) associated with Lawsonia intracellularis infection in pigs. No withdrawal period is required when treated according to the label. Tylvalosin has been shown to cause hypersensitivity reactions in laboratory animals; therefore, people with known hypersensitivity to tylvalosin tartrate should avoid contact with this product. When mixing and handling Aivlosin® 17%, avoid inhalation, oral exposure and direct contact with skin or eyes. Keep out of reach of children. 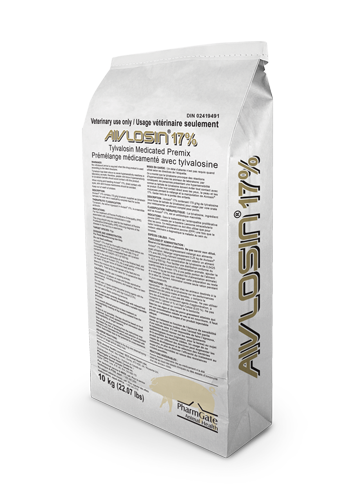 Aivlosin® 17% contains 170 g/kg tylvalosin (supplied as tylvalosin tartrate) for oral use in medicating complete feed for swine. Tylvalosin, the active ingredient in Aivlosin 17%, is a macrolide antibiotic. For the treatment of Porcine Proliferative Enteropathy (PPE) associated with Lawsonia intracellularis in pigs. To reduce the development of antimicrobial resistance and maintain effectiveness, use this antibiotic prudently. For Feed Manufacturing Use Only. Aivlosin® 17% must be thoroughly mixed into feeds before use. Thoroughly mix 0.25 kg Aivlosin® 17% with 999.75 kg of complete feed to obtain a medicated feed with tylvalosin concentration of 0.00425% (42.5 g/1000 kg). To aid in the even distribution of drug in the finished feed, add the full amount of Aivlosin® 17% into a small portion of the feed (at least 10 kg per tonne of finished feed) and mix. Blend this mixture into the remainder of the feed and mix thoroughly. Feed as the sole ration for 14 consecutive days. CAUTIONS: Not for use in breeding animals. The effects of tylvalosin on male and female reproductive performance, including pregnancy and lactation, have not been determined. Do not use in feeds containing pellet binding agents with the exception of Lignosol (4%) and Agri-Colloid (0.3%). Acute cases and severely diseased pigs with reduced food and water intake should be treated with a suitable injectable product. It is sound clinical practice to base treatment on susceptibility testing of the bacteria isolated from the animal. If this is not possible, therapy should be based on local (regional, farm level) epidemiological information about susceptibility of target bacteria. Use of the product deviating from the instructions may increase the risk of development and selection of resistant bacteria and decrease the effectiveness of treatment with other macrolides due to the potential for cross-resistance. No adverse reactions related to the drug were observed during clinical or target animal safety trials. Store in a cool dry place at or below 25ºC.